This week, Hank is joined on Hank Unplugged by Dr. Nathan Jacobs, writer and director of Becoming Truly Human, a documentary that looks at the rise of the "nones" (those with no religious affiliation). The film offers seven cinematic portraits of “nones” alongside the story of today’s guest Dr. Jacobs, whose path goes from unbelief to belief in Christianity, in order to reframe the nones as people defined not by unaffiliation but by a search for something deeper than the religion of ... See More their youth. As usual on Hank Unplugged, their conversation is wide ranging, full of depth, and one that you will not want to miss. Topics discussed include: examining the rise of “nones," a term in the documentary Becoming Truly Human used for people with no religious affiliation (1:00); the history behind the title of the documentary Becoming Truly Human (3:00); the importance of learning from the early church fathers (6:00); is it necessary to pit scripture and tradition against one another? (10:00); clearing up the confusion surrounding the false dichotomy between faith and works (16:30); the judicial tendencies and terminologies often present in Western theology (33:30); what the Incarnation truly offers to us (42:00); exploring the concept of deification (44:00); what Dr. Jacobs found in studying the concept of resurrection in several religions and how it’s unique in Christianity (51:00); using the texts of the early church fathers and the longstanding church tradition to better understand Scripture and enhance our Christian faith (55:00); what it means to become truly human (1:01:00); what it was that Dr. Jacobs discovered many of the Millennial “nones” were searching for (1:10:00); the story of Dr. Jacobs's adopted son and the parable of the sheep and the goats (1:16:30); how both Hank's and Nathan’s personal battles with cancer have provided them perspective and brought them closer to God (1:23:00); where people can see the documentary Becoming Truly Human (1:32:00). Hank, thank you for sharing your conversation with such a great mind and talent, Nathan Jacobs. I plan to purchase his DVD, "Becoming Truly Human: The Film" from the Ancient Faith Store I easily found online. May God Continually Bless you, the CRI team and your Family. 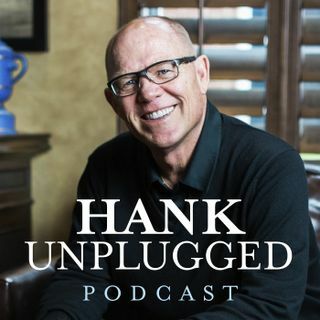 I am truly blessed with the opportunity to be able to listen to you on your daily broadcasts and now your Hank Unplugged Podcasts as well.